Although the Dachshund's unusual form makes it an ideal hunting dog, and many Dachsies are still used for this purpose (see the previous section), the Dachshund's more common role today is one of companion, friend, and resident court jester. But the Dachshund's unusual shape is worth understanding even if you don't plan to hunt a day in your life. Knowing your Dachsie's anatomy will help you understand her health needs and prevent or prepare for potential problems. 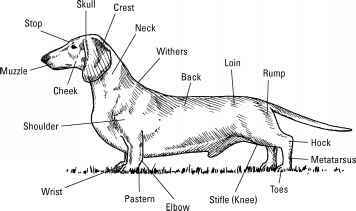 Talking dog anatomy means using plenty of terms that many folks may not be familiar with, so Figure 2-2 shows a boy Dachshund with all his parts labeled. And following is a list — a mini Dachs-tionary — that defines the anatomical terms shown in the figure. This Dachs-tionary comes in mighty handy when you're reading the section "Evaluating the Perfect Dachsie." 1 Cheek: The fleshy area behind the corners of a Dachshund's mouth. 1 Muzzle: The part of the dog's head in front of the eyes, including the nose and jaws. 1 Stop: The place where the muzzle meets the skull. 1 Skull: The head bone, of course. 1 Crest: The back of the skull where it begins its descent. 1 Neck: The area attaching the head to the shoulders and upper chest. 1 Withers: The highest point of the dog's shoulder blades, used to measure a Dachshund's height. 1 Back: The top of the dog, from withers to tail. 1 Loin: The section of the dog between the ribs and hipbones. 1 Rump: The area above the hipbones, in front of the base of the tail. 1 Hock: The joint on the rear legs between the second thigh and the metatarsus (the area between the heel and toes, or rear pastern), corresponding to the human heel. In a Dachshund, this joint sticks out from behind. 1 Toes: The digits at the ends of the paws. 1 Stifle: The dog's knee — the first leg joint between the thigh and what's called the second thigh (see "Hock"). ii Elbow: The joint between the front arm and forearm. ii Forearm: The lower part of the front leg, between the elbow and wrist. In a Dachshund, the forearm should be relatively straight but comfortably shaped around the chest. ii Dewclaw: A functionless fifth toe, which is often — but not necessarily — removed. il Pastern: The area of the foot between the wrist and the toes. il Wrist: The joint between the forearm and the toes. il Shoulder: The top end of the front legs, connecting the legs to the body. Figure 2-2: The Dachsie's anatomy in all its glory. The American Kennel Club publishes a standard for the Dachshund that was developed by the Dachshund Club of America, Inc. (DCA), and that defines and describes — in great detail — the ideal Dachshund. Every so often, this standard has been updated to further improve the breed. The most recent revision officially took effect in March 2007, the first change to the standard since 1992. (some with serious consequences, and others with mostly cosmetic faults). 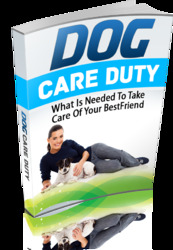 The standard can further the good health and good looks of the Dachshund breed. i Some aspects of the breed standard detail important qualities that happen to be particularly relevant for pet owners. For instance, the breed standard says that a Dachshund should appear "neither crippled, awkward, nor cramped in his capacity for movement" and that his temperament should be "clever, lively, and courageous . . .". In other words, a sound body and mind make for a wonderful pet as well as a technically correct Dachshund. That said, some people do like to know that their dogs are as close to perfect as possible. And, because it never hurts to understand the ideal for your breed, this section goes over the AKC breed standard for the Dachshund in detail. The standard is largely based around qualities that ensure good health and the betterment of the breed (the goals of any good breeder). For more on all the characteristics of a Dachshund, jump over to Chapter 3. Don't be too critical of your beloved pet if she doesn't fit the breed standard very well. Who cares if your Dachshund's eyes aren't perfectly "almond-shaped and dark-rimmed," if your smooth Dachshund's coat is a little too thick, or if your Standard Dachshund is the biggest one you've ever seen; she can still be the most perfect pet you've ever had. Plenty of love, attention, and care — coupled with proper management and training — are the things that make a good pet, not the perfect coat texture or profile. How to strengthen your dashounds eyes? 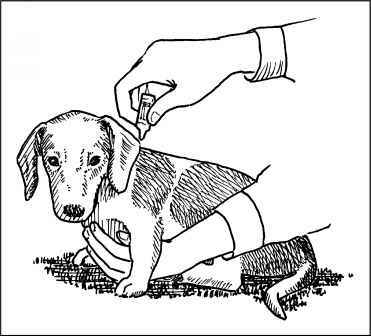 How to measure to the shoulder of your dachshund? Do dachshunds have wrist joints? Do all dauchshund puppies have short thick legs? Why do dashhounds have a pointed scull? What do the bone structure of a wiener dogs? Why does a dachshund have a broken nose? Why does my mini dachshund puppy ribs stickout? Why does my miniature dachshund's spine show? How many bones does a dachshund have? How thick is a mini dachshund's skull? Does all daschunds have pointed noses? Why dachshunds have a bone?